Kenya’s Twiga Foods has raised $10 million from investors led by the International Finance Corporation to add processed food and fast-moving consumer goods to its product line-up. The startup has built a B2B platform to improve the supply chain from farmers to markets. Twiga Foods now aims to scale additional merchandise on its digital network that coordinates pricing, payment, quality control and logistics across sellers and vendors. “If we can build a business around fresh fruit and vegetables, everything else after that is much simpler to add on,” he told TechCrunch. “Fresh food and vegetables gives you clients that are ordering every two days, and now that’s paying for access to vendors and a proper way to be on every street,” said Brooke. “It’s now much easier to lay things over that that would have been very expensive to get to end retailers.” In addition to the processed food FMCG it will add now, CEO Grant Brooke named household goods, such as light bulbs that stock and sell in lower volumes than produce, as something the startup could include in the future. The $10 million IFC-led investment — co-led by TLcom Capital — comes in the form of convertible notes, available later as equity, according to Wale Ayeni, regional head of IFC’s Africa VC practice. As part of the deal, Ayeni will join Twiga Foods’ board. Of the decision to fund the startup, Ayeni indicated IFC likes what the company’s already done in “figuring out a way to service a mass market with a digital platform focused on food in a sector that’s not really been touched,” he said. Another factor was Twiga’s prospects to create additional revenue by improving B2B supply chain for FMCG and other consumer products. Co-founded in Nairobi in 2014 by Brooke and Kenyan Peter Njonjo, Twiga Foods serves around 2,000 outlets a day with produce through a network of 13,000 farmers and 6,000 vendors. Parties can coordinate goods exchanges via mobile app using M-Pesa mobile money for payment. The company has reduced typical post-harvest losses in Kenya from 30 percent to 4 percent for produce brought to market on the Twiga network, according to Brooke. “That’s savings we can offer the outlets and better pricing we can offer the farmers,” he said. Twiga Foods generates revenues from margins on the products it buys and sells. As an example, the company could buy bananas at around 19 shillings ($.19) a kilo and sell at 34 ($.34) shillings a kilo. “Our margin is how efficient we are at moving products between those two elements,” and the company purchases from farmers at roughly 10 percent higher than Kenya’s traditional produce middlemen, according to Brooke. 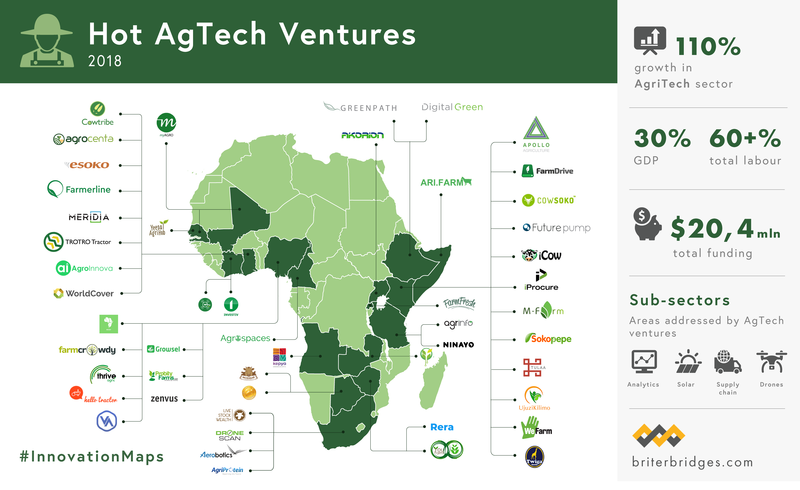 Agtech has become a prominent startup sector in Africa. A number of companies, such as Ghana’s Agrocenta and Nigeria’s Farmcrowdy, have raised VC for apps that coordinate payments, logistics and working capital across the continent’s farmers and food markets. In 2017, Twiga Foods raised a $10.3 million Series A round lead by Wamda Capital. Earlier this year the startup partnered with IBM Africa to introduce to its network of vendors a blockchain-enabled finance working capital platform. With the new investment and product expansion, Twiga Foods will explore offering to its client network additional financial services. The startup doesn’t divulge revenue information, but “profitability is on the horizon for us,” said Brooke. Twiga Foods will maintain its focus primarily on Kenya, but “we’re starting to research and dabble in Tanzania,” according to Brooke. The startup doesn’t plan to move beyond B2B to direct online retail. “I don’t think B2C e-commerce is viable on the continent once you factor in job size and cost of acquisition versus lifetime value,” said Brooke. He also named the high cost of marketing: “In B2C e-commerce space you really have to be in the advertising space. Our clients are ordering every two days with no marketing budget,” said Brooke. So for the time being, Twiga Foods aims to stick with improving the supply chain for products between Kenya’s buyers and sellers.